An educator pack for young learners. This pack is a perfect way to jumpstart any learning environment. It was inspired by the needs of our youngest learners and was designed with Pre-K and Kindergarten students in mind. However, you will find that it works great for older students, too. 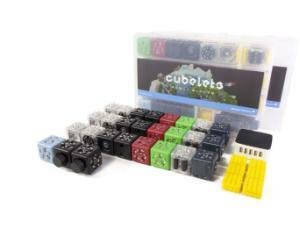 The Bluetooth functionality allows for easy software updates and Cubelets programming activities. The Mini Makers Pack supports six groups of learners. Includes 54 SENSE, THINK, and ACT Cubelets, Brick Adapters, storage, and a 5-port battery charger.